I have to say, I have mixed feelings about posting this functional resume example. 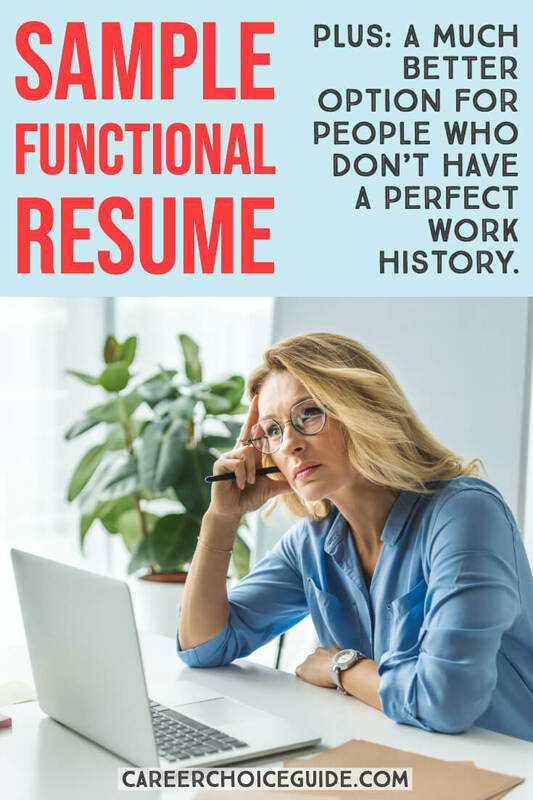 On one hand, people are curious about this resume format, but on the other hand, I believe a functional resume is never the right choice for a job seeker in any situation. Because this resume style omits all work experience and education, job seekers sometimes use it to try to hide concerns like gaps in their work history or incomplete education. The problem is, employers know you're hiding something, and they just don't trust a resume written in this style. I've never written a functional resume for any client, and I've worked with about 2000 clients. There is always a better way to minimize concerns with your work history or education. In fact, I've worked with several clients who came to me with a functional resume and had been unsuccessfully job searching for months. We worked together to change to a combination format, and they were working soon after they started sending out the new, improved format. Machine operator with 5 years of experience in a resin manufacturing plant. Safe and dependable worker; able to troubleshoot and meet quality standards and production quotas. Here is an explanation of why this functional resume was formatted in this specific style.